So far this NaBloPoMo, I’ve managed to write a fresh post every day without resorting to a re-post of one of my old favorites. However, I noticed a fun-sounding Post-a-Day yesterday when I was scrolling through the Reader and realized I had written something years ago that would respond beautifully to the challenge. It brings up some great memories, too, so I thought I would share again. 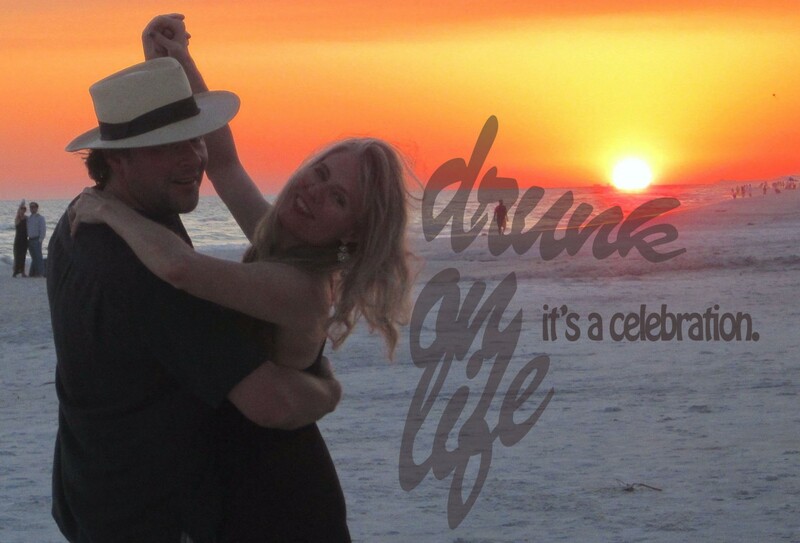 This is a story from 2011, right after my husband and I met, about a very special dinner. Just in case you’ve missed the clues, I am a Ferguson. For the uninitiated, uninformed or uncaring, that means I’m of Scottish heritage, something my family is insanely proud of; after all, we are descendants of the first kings of Scotland. Our royal pedigree made absolute sense when I found out – I’ve always felt I was a princess, my tiara is simply implied. 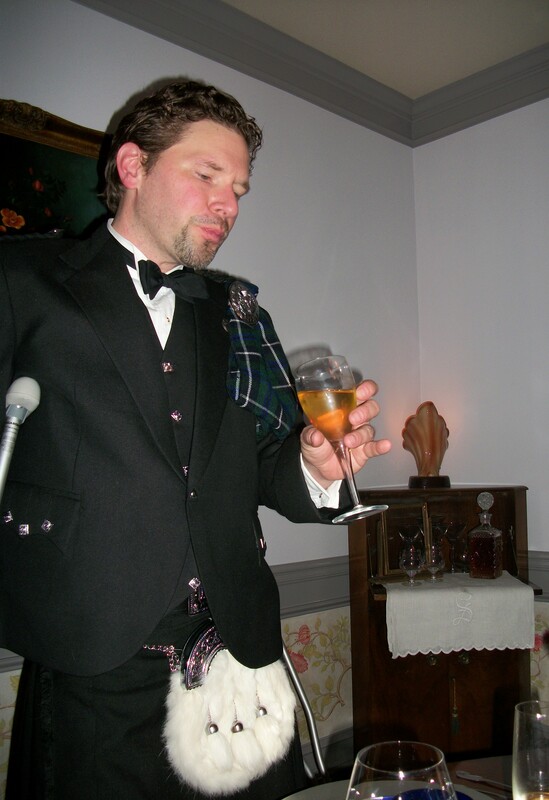 Since eating, drinking and being of Scottish descent come somewhat naturally to me, I had always aspired to host a Burns Supper, but in the past had found myself overwhelmed by the proscribed ritual: the entire night is shaped around a complicated timeline of speeches, toasts and songs a little beyond my American-born and raised sensibilities. I was also intimidated (read: flat out terrified) at the thought of creating the traditional menu, as it stars not only “Neeps and Tatties” (mashed turnips-bleck! and potatoes) but features the dread Haggis as centerpiece of the entire event. To be honest, for me, organ meat steamed in sheep intestine doesn’t exactly pique any desire to chow. Ahh, but now! A partner in crime! Not only Scottish, but an excellent chef and delightfully (and possibly foolishly) excited to do things with me. Let the (Highland) games begin! We decided to stage the event at David’s house, since he would be doing most of the cooking. If you’ve been following along with my blogging adventures, you know by now that I’m not only not much of a chef, but neither do I possess the culinary infrastructure required for major meal production. 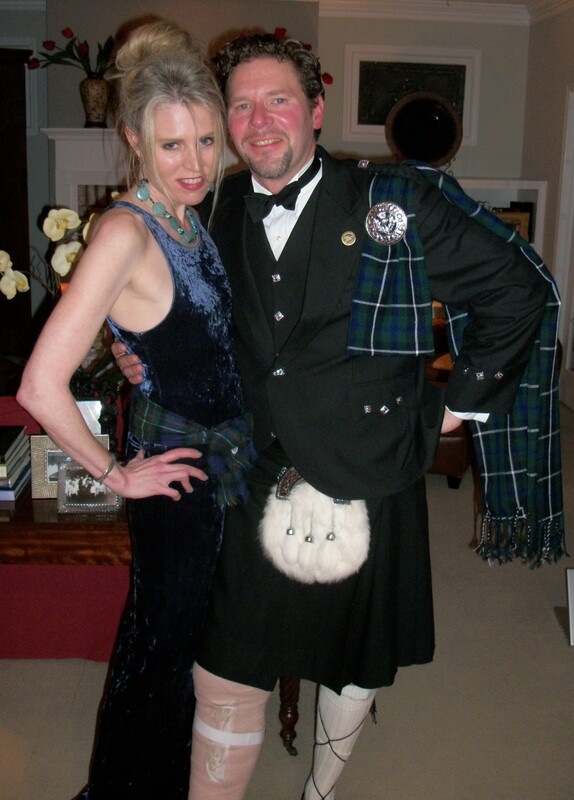 The guest list was easy: my dear friend (and fellow Scottish-American) Dana McPherson, who I knew was not only familiar with Burns Supper, but culinarily adventurous, free that evening and and in possession of a formal dress kilt with no apprehension to wearing. The next step was to convert the menu to something that, in my opinion, was actually edible. Judicious internet research revealed, ta dumm!, that others share my aversion to turnips and tripe, and have created alternatives to the classic offal and root veg offering. Armed with a “Neo-Scottish” menu and a sheath of recipes, David took over in the kitchen, leaving me to figure out my wardrobe for the evening. David, despite limited mobility due to a broken leg (fodder for another blog post) had managed to acquire a last-minute formal dress kilt, but I was scrappin’ for anything fancy-n-Ferguson, finally donning a royal blue velvet Betsy Johnson slip dress with my Ferguson scarf jauntily knotted over one shoulder and afixed with our Clann kilt pin. Not nearly as fabulous as the boys, but would have to do. Due to a spectacular and incendiary incident with a can of compressed air and a faulty furnace (yes, also most likely another blog post) Dana arrived late, a little crispy around the edges, but properly bandaged and bearing our evening’s libations. 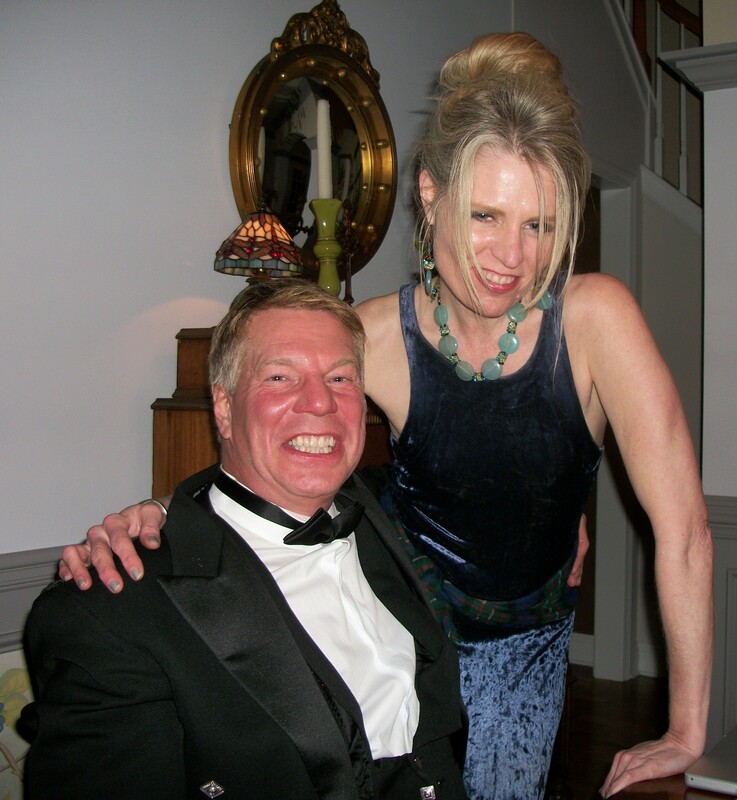 He was primed with pain meds, but David and I had taken the precaution of blunting our trepidacious tummies with the contents of a bottle of champagne (a Nicolas Feuillatte Cuvee Palmes d’Or 1996, a gift from Dana and a really incredible bottle of wine, btw. ), so we were all three buzzily excited when we finally sat down around 10 p.m. for our official celebration. 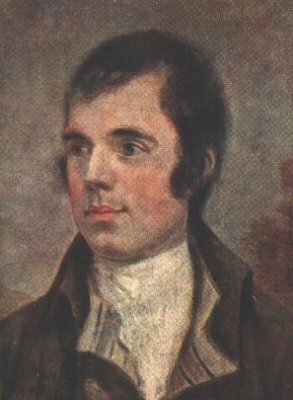 The first order of business, according to Tradition, is to say a blessing, called the Selkirk Grace or the Kircudbright Grace, made famous by Burns who recited it for the Earl of Selkirk near Kircudbright. Next up: the grand event! David, bless his heart, had not only undertaken cooking the entire dinner (hey, I did make the salad) but had also spent weeks learning the infamous Burns’ poem, “Address to a Haggis.” According to ritual, after the salad (or first course), the haggis is born in triumphantly (ahem) on a platter, accompanied by bagpipe music. The host then lauds the haggis with Burns’ immortal tribute. (ahh, modern technology) but executed it with such zeal and such an admirable brogue, that Dana and I were stunned into silence. (Well, to be honest, we were mostly stunned from two bottles of excellent Chardonnay, a 2002 Darioush Reserve, and if you listen to the video we took of the night, the “silence” part is also a little questionable.) Needless to say, we were pretty impressed. The poem ends with a dramatic (and somewhat violent) stabbing of the Haggis (I presume to let out the steam, but knowing what goes into traditional haggis, my thought is it probably originated as a precaution). I have to say, David did a spectacular job – the Neo-Haggis was really quite tasty and I went back for seconds of Neeps N Tatties! We paired the entree with Dana’s contribution of a 2000 Darioush Reserve Cabernet –truly an exceptional wine (not that we were in any perceived danger of dehydration by then) which David broke up with shots of Johnny Walker Black Label Scotch for inspiration. The evening’s framework cust0marily calls for more toasts and speeches, including a toast to Burns’ Immortal Memory and a “Toast to the Lassies” to which I had prepared the counter-toast, the “Reply to the Laddies,” (“Down with trousers! Up with kilts!”) but it was so late by the time we’d finished dinner that we decided to save them for next year. 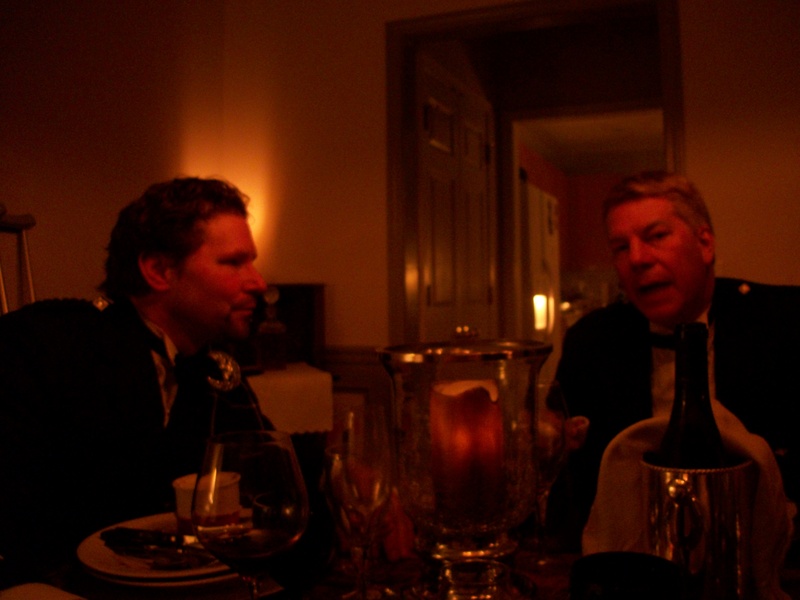 It was a truly lovely night, dare I say say intoxicating, in every way, with great companionship and wonderful food and wines. What a fun, fabulous and incredible ode to our heritage! This entry was posted in Cooking, Entertaining, nano poblano, Relationships and tagged Burn's Night, Burn's Supper, nablopomo, nano poblano, postaday, Robert Burns, team pepper. Bookmark the permalink.